Could you handle eating this massive ice cream sundae -- in freezing weather? Spring is just around the corner, so we decided to say goodbye to winter in the best way we know how: with our own brain-freeze challenge. As an avid ice cream eater, I've always hated when people say, "It's too cold for ice cream." My response to them is: never. The "I Bet You Can't" ice cream sundae from Dylan's Candy Bar in New York City is a challenge in itself. The massive treat consists of 10 scoops of different ice cream and 10 crazy toppings from cotton candy to rock candy. Normally, Dylan's Candy Bar has a maximum two customers competing against each other at a time to see who can finish the sundae in 10 minutes. 10 minutes. 2 people. 10 scoops of ice cream. ALL the cake, brownies, cookies and candy. THIS is our *I Bet You Can't* Sundae… Will you accept the challenge? Now at NYC and Chicago cafes! "We get a lot of families who come in and they want something fun for the table that's a bit interactive that they can share," Mark Sharma, senior food and beverage manager at Dylan's Candy Bar, told "Good Morning America." "Good Morning America" digital producers, Elisa Tang and Chris Cirillo, attempt to eat the massive "I Bet You Can't" ice cream sundae from Dylan's Candy Bar in the freezing weather in Central Park, New York. "To date, no one has actually finished the challenge," Sharma said. 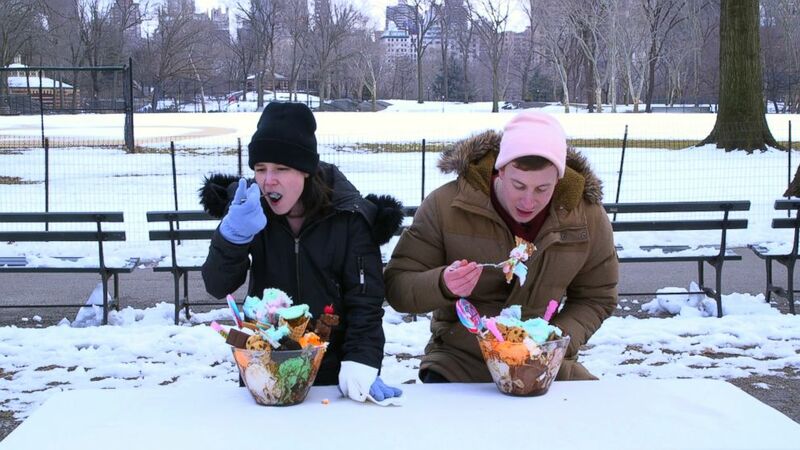 We wanted to take this challenge up a notch by seeing who could finish the sundae in 10 minutes in freezing weather in Central Park, New York. Could they handle the freeze? Watch the video above to find out or try the "I Bet You Can't" ice cream sundae from Dylan's Candy Bar yourself. It's $40 and available at all New York City locations.